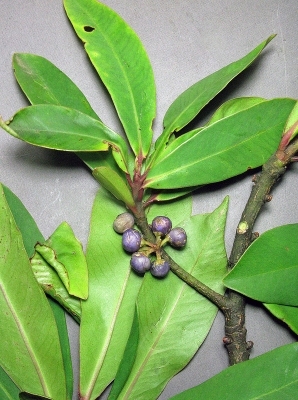 Myrsine simensis Hochst. ex DC. Rapanea pulchra Gilg & G.Schellenb. Rapanea usambarensis Gilg & G.Schellenb. Myrsine melanophloeos is an evergreen shrub or tree growing from 3 - 18 metres tall and producing suckers to form clumps[295,308]. The plant is gathered from the wild for local medicinal use. The timber is also used locally. Widespread through tropical Africa, south to S. Africa. An excellent site giving detailed descriptions and uses of many S. African plants.